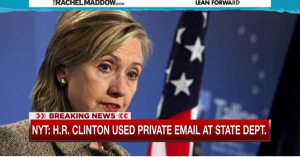 Report: Hillary Clinton used private email throughout tenure at State Dept. Presumed Democratic front-runner Hillary Clinton pushed back Tuesday against accusations that she ran afoul of federal record-keeping regulations by using her personal email address while serving as secretary of state. The practice may have made Clinton’s correspondence susceptible to cyber attack and potentially skirted the Federal Records Act, which requires government officials to preserve email records, according to a new report from The New York Times. Clinton did not have an official government government account while at State, using a personal email account to conduct all her business, the Times reported Monday evening. With Clinton already facing criticism over her family foundation’s acceptance of donations from foreign governments, Republicans were quick to pounce on the latest development as a pattern of a lack of transparency. Democrats quickly pointed out to msnbc that Clinton is hardly alone in using personal email to conduct business, noting several Republicans eyeing 2016 runs did the same. Meanwhile, Wisconsin Gov. Scott Walker reportedly used a “secret” email system to conduct political business while county executive of Milwaukee. And staff of New Jersey Gov. Chris Christie have used gmail and Yahoo! accounts in the past. Nonetheless, the federal government, and particularly a national security agency like the State Department, provides additional challenges and complications to state government, which have different record keeping laws.